Virginia Beach, Virginia is located on the south-eastern shore of Virginia and is a popular resort east coast destination for people from all over the country. With 28 miles of beaches bordering the Atlantic Ocean and the Chesapeake Bay, it is the home to the ever popular annual East Coast Surfing Championships. Virginia Beach features many family oriented attractions such as beach side events, art festivals on the boardwalk, wine festivals, golf courses, fishing, water parks and recreational parks, camping sites, hotels, restaurants, shops and wonderful Virginia Beach real estate. Just minutes away from the Virginia Beach Oceanfront is Norfolk International Airport. a major hub for several domestic and international airlines. Several military bases make their homes in Virginia Beach and all over Hampton Roads, as do the corporate offices of many major corporations. In many parts of the city, the walkability factor from residential neighborhoods to shops, restaurants and schools create a friendly, small town atmosphere within this large sprawling city. With the variety of home styles and prices, whether it be townhomes, condos, ranch homes, beach cottages, and sprawling estates Virginia Beach is an affordable place to own a home driving an increase in Home Sales of all budgets and income brackets. The area enjoys all four seasons, allowing residents and visitors alike to boast of the mild winters, colorful spring and fall, and warm sunny summer months. Thousand of families end up relocating permanently to Virginia Beach after years of making it an oceanfront vacation destination. Investors and families alike find the climate and home prices of Virginia Beach Homes for sale make the area a desirable place to spend their real estate dollars. The City managers and business leaders have worked hard in recent years to make Virginia Beach an even greater Hampton Roads location in which to live, work and play. Real estate prices are still low compared to many other large cities throughout the United States, making it a desirable retirement destination as well as an affordable place to raise a family. Many military families who are temporarily stationed in Virginia Beach during their careers end up making it their permanent home due to the reasonable cost of living and the abundance of year round family oriented local activities. Find Virginia Beach homes for sale below: Listings below feed from local mls service provided by Don Maclary of William E Wood and Associates. The great thing about living in Virginia Beach is that there’s never a dull moment. The city has worked hard to make sure that they have provided plenty of opportunities for the residents to enjoy themselves. Not only do the small festivals and events encourage the residents to get out of the house and enjoy themselves, but the festivals also bring a little extra money into the community. You don’t need to be an experienced angler to enjoy the Virginia Beach Tuna Tournament. Even if you don’t fish, you’ll enjoy the excitement that surrounds this event and have a great time cheering on your favorite angler. The event was started in 2005 and grew at an astonishing rate. More than 60 boats are expected to participate. During the day, anglers will hit the water and try to bring in the best tuna , and at night they will enjoy a variety of dock parties and be able to swap stories while watching live entertainment. There’s something about Gospel music that manages to be both chilling and uplifting at the exact same time. If you’re in Virginia Beach and love Gospel music you need to make sure that you have your calendar cleared so that on the first weekend in May you can attend Gospelfest. The great music you hear during this unique event will make your heart sing. In addition to being able to listen to some of the best gospel groups in the country, you’ll also learn some gospel dances which will keep you on your toes. If you love to run, you’ll find Virginia Beach very satisfying. Not only does the area have a wide selection of safe and visually interesting routes, you will also be able to partake in all kinds of marathons and races. In addition to bragging rights, the winners of most of the marathons also earn a monetary award. Perhaps the biggest event, the one that draws people from all over the world is the Verizon Wireless American Music Festival which takes place in Virginia Beach. This event happens to be the single largest music festival the entire east coast has to offer, and is also one of the largest in the country. Music acts from all over the country find their way to event’s stage, which is 60’ wide and another 60’ tall. Some of the biggest acts in the world have graced the stage. If you’ve never been to Virginia Beach’s Neptune festival, you don’t know what you’re missing. It’s a must attend kind of event. Well over a hundred thousand people are expected to attend the event this year. 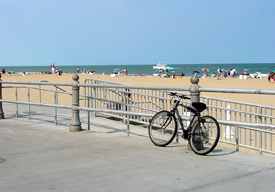 The event is a toned down, homey version of the American Music Festival and takes place on the Virginia Beach boardwalk. During the three day, outdoor event, you’ll be able to enjoy all kinds of live entertainment up close and personal while treating yourself to a great selection of local food choices, and indulge in some shopping at the same time.